Ancounter of FYUP without any trial by various political systems like ABVP,NSUI,MHRD,UGC,DUTA etc!!!! Economical situation of Indian Railway is very bad!! Everyone knows it. only passengers are responsible for it!! Is hiking the fare only solution for this?? In last two years railway fare has been increased several times and promised to improve security, facilities etc.. But result we all know very well situation of passenger in a train in India.. It is almost same as It was 5 year back!!!! Now they have increased it again !! NETA JI, Vote pahle do fir devlop karenge, auar yahan paisa pahle mang rahe ho fir facility doge!!! wi-fi laga nahi train me hum uska paisa pahle se hi dene lage !! Hum bewkoof h kya!!! Security, ye to pahle se hi railway ka farz tha jo wo dhang se nibha na saki aur ab bolte h ki agar security chahiye to aur paisa do!!! If economical situation of railways is not good, they why is railways increasing the salary of its employees every year at high rate!!! 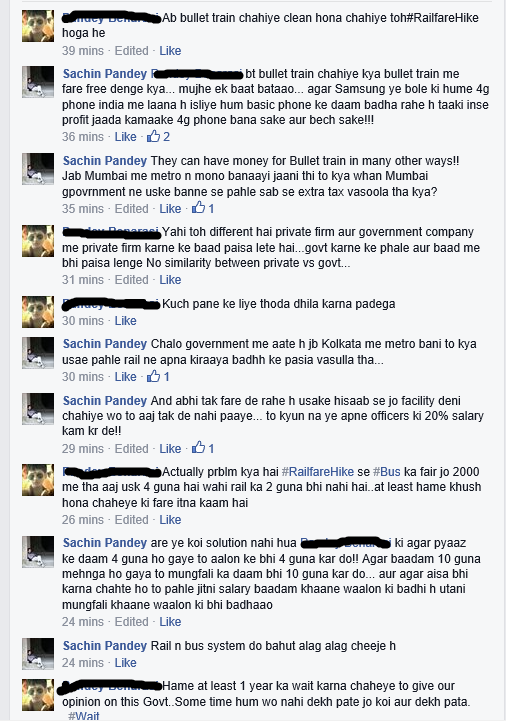 Why railway give concession and passes to its employee.. They earn enough and they can afford full fare.. But no railway will throw own burden on you, me, us, public… If they can take some hard steps for these things and control corruption in railways they can increase the profit of railway by 20 to 25 % then there will be no need of 14-15% of fare hike!!! Why not railway charge extra fare on ticket booked on HEAD OFFICE QUOTA.If they just doubled the fare of said quota then income can be increased by 2-3 % as in every train there are 2-10% head office quota!! Why they can not decrease the allowance given to employee to improve its situation..no they only want to loot us and distribute among themselves!! Please keep in mind by employees I don’t mean railway low class workers! 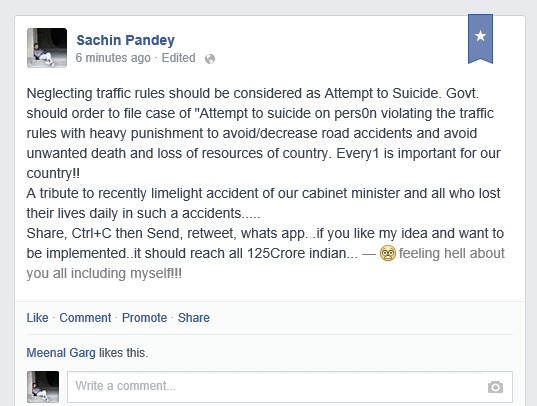 I strongly criticize this fare hike!! Government should withdraw it immediately and look into alternative to improve its situation. You think!! Am I wrong! Please comment below your views and share if you like! I am also attaching a picture of conversation have on this issue with my one friend over a social media site. Must see it. Against Four Year Undergraduate Program : Must read it. Now a days, Student unions of university of Delhi are protesting again University of Delhi officials and demanding withdraw of FYUP!! Many students also think that FYUP is not good. I have seen few reasons written on banners of those unions. 1. Wastage of Money and Time!! They are claiming that student will waste now one more year and money too!! But perhaps they have forgotten that in FYUP, you can leave the course even after three year with graduate degree and you can do MSc, MA, M.Com etc. Yeah and if you want to study advanced topics then you can continue in 4th year. After having 4 year degree you will have bright future ahead specially study in abroad. In fact University of Delhi is thinking to offer 1 year postgraduate degree for students having 4 year degree. And one more thing, even many old students with 3 year degree waste their one more year in coaching and preparation to get admission in post graduate courses so now they may enjoy 2 trial for those examination without dropping/breaking their education, one in their 3rd year(If you get selected leave the course and join your postgraduate ) and if not you can continue 4th year and preparation also and get admission even in abroad. And except your DC-I or main subject, you can choose any other subject of your own interest to study as DC-II. That mean student pursuing B. Com hons can also study physics .. This will enable more option to student for their higher study. So who don't like 4 year degree, you can leave after 3 year. No one will stop you. 2. "Bakwaas" Foundation Courses !! So now you think : Are these courses useless!! Having knowledge of one more language is useless!! Having knowledge of governance, citizenship, environment, Communication skills are useless!! Some knowledge of Indian history is bad!! Knowledge of IT, business management are bad!! If your answer is YES!! Then either you are master in these or these things are useless for you.. It may be possible that some students are good in these subjects already but university has made a common syllabus for every student from all over India. A student who don't know Hindi, and He/She can get a chance to study a practical Hindi !! How it can be useless!! This was only one reason written in those banners that have little bit sense to make. These things can be solved in near future. Those union can demand to improve this. But demand of withdraw of FYUP is totally non sense. Above post is totally writer's personal view. It has no relation with any university official, political parties and unions. Share to max if you agree!!! Contribute to Nation by convincing your friends to Vote! How many friends do you have in college? How many on Facebook? How many on twitter? and other social circles…. May be total 400 to 500! If you can make all of your friends to vote this time in LS2014, it will be great contribution of you and your friends for our country. May be some of your friends will not have Voter ID card, It is bad luck for them as deadline is over.But you can easily convince all others to vote. If you can convince your friends to bunk a lecture, go for party, helping in study, helping in your life etc., then you should also convince them for voting for country in this LS2014. I can do it, you can do it, we all can do it for our country so let’s start. I have started this, now it’s time for you to contribute for nation and tends to 100% voting and right MP in parliament. To claim to be perfect is just Nonsense! Hello friends! How are you? Happy HOLI to you all.Here I have come up with my new blog.In this I am going to talk about myself, you, politician(Indirectly as it is season of election)..
First of all definition of “perfect” varies person to person, things to things, place to place or in Scientific language you can say it’s different in every frame.Ideally there is nothing like “perfect”.There is no one 100% honest, No one speaking just 100% truth, No one who has never hurt any one! No one who has never cheat themselves or any other! In the race of success, Calming of being perfect or number 1 has become very traditional these days with unorthodox styles! The time a thought (which is bad according to your lifestyles or principle ) comes in your mind, you lost the “perfectness ”. Let’s talk about student (including myself), Have thoughts of getting answer from somehow in any exam when you don’t know not come to your mind? It’s different things that you might have controlled yourself on the basis of your ethics! Don’t you or I wish to get better or same marks in exam once we get good marks? After having 100 Rs, Don’t you wish to have more? After getting famous in your friends for some of your hidden ability , don’t you want to explore that to world? Here a thief (in your own definition) is hidden in every one. How much one can control, it is million dollar question! Now let me correlate this with politics that has been become our favorite topic of discussion due to Lok Sabha Election 2014 where corruption is one of the main issue of all political parties. All are claiming they are neat and clean and blaming everything other than themselves! So now our job has become more crucial, where to go whom to vote, who is perfect! Answer is “No one is perfect, not even we!”. But we have to vote and so find better candidates in your area vote them. Happy HOLI and Happy elections to all! LS2014 : Suspense, Thriller, Drama & Climax= Full entertainment? Election Commission has announced the releasing dates of LS2014 in our country.It seems that “LS2014” is going to defeat all other TV serials, movie, and cricket matches in terms of TRP.According to EC, Huge % of participation of people of India in LS2014 is highly expected. LS2014 is going to be totally different from LS2009 or LS2004.Every star is presenting himself in new Avatar. 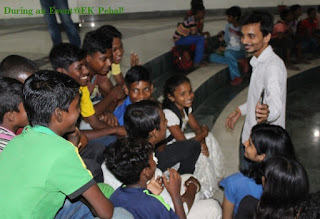 All are calming that they are going to be superstar of people! They are promoting themselves in various places daily with Great Dialogues , Promises, Criticizing others stars.This time social media like Facebook is also one of the platforms of their promotions.Many of them has innovated new ideas.Someone is meeting “HAND” to Hands,someone having “Tea” with others, someone has become “Sweeper”.In same movie, every performer is fighting with each other to be best! Theme of LS2014 is going to be “Corruptions”,”Unemployment”, “Women Security”, “Poverty” and other critical issues.Although Budget of LS2014 is very limited as informed by EC, but it is expected that there will be huge use of “black Money” in promotions of performer. Whoever wins the best performer award of LS2014 on 16th may, surely it is going to entertain us very much.I also recommend you to participate in it and contribute to nation by rating LS2014.There are very tough fights so your support(Vote) will matter a lot! So be their on releasing dates(Voting Dates) in your respective poling areas and Vote! Weeks are passing like days.. I have to find some different ways.. Nothing left except submission deadlines.. I am searching for some lifelines..
Was making building without a good base.. Willing to cross the Mount Everest..
Was living in big confusion..
Time to figure out the solution.. 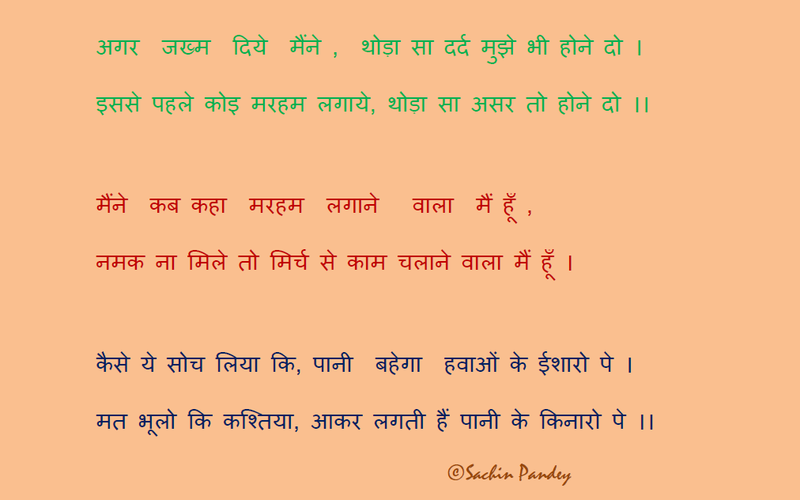 I have written it for my school magazine when i was studying in class XII.Hope you all will like it. I am writing this blog after reading a book “सपने कहाँ गये ? ‘’ by a great hindi sahitya writer “Vidya Niwas Mishra”. I am going to share some of his lines about the situation of country and our dreams. He , Vidya Niwas Mishra , has written this book in 1998 but I still find his lines very correct. What do you think? Please comments or share if you are agree.